It is so too hot in Athens to fight the way the Greeks keep time – or rather the way that they don’t. You just have to get used to it and go with it. I quit going to bed early with a view to a bright start in the cool of the morning, once I realised that unless I was trading with Asia or anyone further ahead of us in time, it was pointless trying to get anything done first thing in the morning, as no one was up nor anything open. Most Greeks spend little time over breakfast (usually a short black coffee and a smoke), but then they will spend a leisurely morning sitting around in cafes, reading the paper or exercising before sauntering to work mid-morning to organise a lunchtime meeting for about 4pm. Lunch might start at 4 or 5 in the afternoon and go on for a couple of hours (the time at which some Northern Europeans are thinking about supper), after which people might go to bed for an early evening nap; before going out for coffee at 8.30pm and to eat again at around 10 or 11 at night, with drinks and dancing getting underway from midnight and the small hours of the next day. The days when work started at 8am and finished at noon, with most people going to bed after lunch for a siesta in the heat of the day and returning to the grind from 4 until 8pm, seem to have been confused by the global market place and international time keeping and communications. Shops keep reasonably traditional Mediterranean times: 8 or 10am to 2pm then 5 to 8 or 9pm, depending on the region and what they are selling, but basically most businesses keep whatever hours they feel like. As a nation of Southern European insomniacs, people go to bed when they are tired and hate waking each other up with the phone or doorbell, no matter what time of day it is – you politely and quietly leave a message, knowing that whoever you are trying to contact will get back to you when they are awake. Once you’ve been here for a while, it all makes sense – it’s too hot to rush anywhere and everyone is very up front about the fact that they might be going to bed in the next 10 minutes and can they help you before they do so? 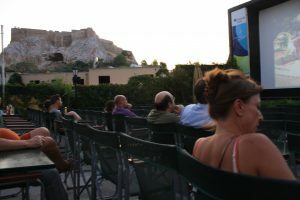 One thing I do love about Greek media, though, is the love of film and the fantastic summer cinemas that entertain the nation in the open air. 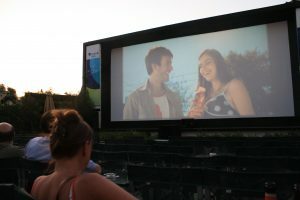 These are not drive-in outdoor movie theatres as you might find in the new world, just lovely old-fashioned outdoor cinemas on the beach or at the foot of the Acropolis or in any built up urban or leafy suburban area. At my local, Cine Flisvos, you can see the rigs of supersail yachts in the marina one one side of the screen, hear cicadas chirruping on the other, listen to the Aegean lapping the beach behind and view the stars above the screen as the credits roll. While Cine Paris in Plaka has a fab view of the Parthenon illuminated beside it.